CARVED FURNITURE - we offer carved furniture with variety of sets and models - familiarize with the range of leather upholstered furniture and fabrics. 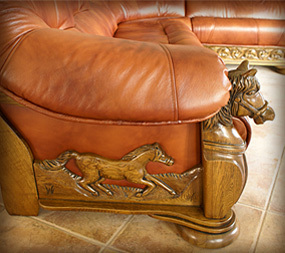 We guarantee reasonable prices because we are a PRODUCER of carved furniture. Sets, corners, sofa beds etc. Our sets can be adapted to any room: hotels reception, living room in a mansion or a cozy room with a fireplace in a detached house. Comfort is guaranteed. Details of furniture, sculpture illustrated are developed and tailored to the character and style of our carved furniture. You can add to our sets tables, chairs and pouffes and even beds - depending on the model. You can adjust the offer to a specific contract. Sets, corners, sofa beds, couches, armchairs and pouffes. Curved furniture in leather and fabric. Fabric which looks like leather! 2. 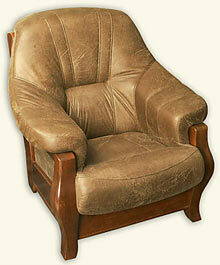 Select the type of upholstery (leather or fabric) and color. We have a full range of Italian leather and fabric upholstery - not only what is visible in the pictures on our website. Discount offer to re-purchase: Discount for customers who have bought from us living room furniture before (in leather or fabric). 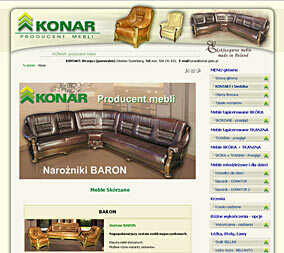 Maintenance of leather and fabrics. Furniture normally used should be periodically maintained to remained a fresh look as long as possible. Although the customers of our furniture live all over Poland, we naturally deliver the most of furniture to customers living in the Pomeranian province. Słupsk, Lębork, Tczew, Starogard Gdański, Chojnice etc.